Before Tuesday's sessions started on day two of WWDC, Apple took over San Jose's City National Civic event venue across from the convention center and set it up for fitness guru Kayla Itsines, an author, trainer and co-founder of the SWEAT app, focused on helping women to reach their fitness goals via plyometric training using minimal space and equipment. 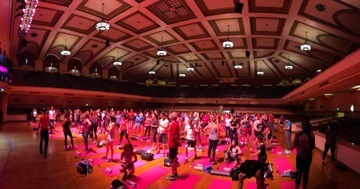 Nearly 200 participants from WWDC attendees and Apple employees filled the space, and Itsines led them on an intense 45 minute High-Intensity Interval Training program. I've been doing regular CrossFit workouts for months, but this workout was challenging. I not only filled my 30-minute exercise ring, but burned enough calories to fill that ring as well. Itsines's HIIT workout laid out a fast-paced series of floor exercises focused on different body areas, with both easier options and alternative moves of greater difficulty. Before starting, she told the group to keep moving--even dance in place--if they ran into a part where they couldn't keep up. Most importantly, "don't get on your phones!" she said. Afterward, the sweaty group took photos as a group and with their star trainer and Julz Arney, the Apple engineer who the day before had demonstrated new watchOS features on stage during the keynote while doing a stationary bike workout. The HIIT session isn't the only fitness activity Apple has scheduled during WWDC. Wednesday morning the coaches from Nike Run Club will be leading attendees on an early morning run through San Jose starting at 6:30 am.